Scafell Pike is the tallest mountain in England, and one of the four 3,000ft peaks in the Lake District. As a result it attracts walkers from distant valleys and has gained a reputation as being a long, hard walk. This is very true if one starts from Borrowdale, Eskdale or Great Langdale, but not true from Wasdale Head. Your choice of starting point limits your route - from Borrowdale you can either head to Sty Head and take the Corridor Route, or come up Grains Gill to Esk Hause and the Great End ridge. From Great Langdale the route follows Mickleden, climbs up Rossett Gill, passes Angle Tarn to reach the false Esk Hause and then pass the true Esk Hause on the way to the Great End ridge. From Wasdale Head the main route goes straight up Lingmell Gill, up Brown Tongue and into Hollow Stones before following the easiest route onto the top. On this route the summit is less than two and a half miles from the summit, compared to four miles for the walker starting at Seathwaite in Borrowdale and nearly five and half from Great Langdale! Thousands make it to the top of Scafell Pike each year. Many are doing the Three Peaks challenge, where it falls between Snowdon and Ben Nevis. Others are doing the climb for charity (thus a fair scattering of fancy dress at the top) while others climb it simply because it is the highest peak. I've seen people playing darts at the summit (complete with dart board on the cairn) and I've taken nonalcoholic punch and a gas stove to the top in the past. Any ascent of Scafell Pike on a clear day produces a sense of satisfaction not equalled by the ascent of any other fell. There are three ways onto the summit plateau of Scafell Pike. The easiest climbs up the north-western corner of the summit cone, and can be reached either from Wasdale Head via Hollow Stones, or by using the Corridor route from Sty Head. 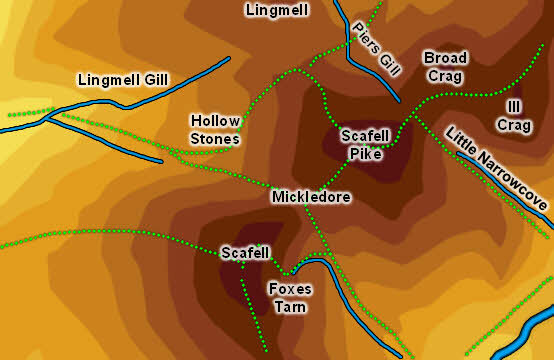 The second route is via Mickledore, the col linking Scafell and Scafell Pike. This can be approached from Hollow Stones along a fairly easy path that ends with a scramble up a scree slope then up a gully, or from Eskdale, on a long hard slog from the river. The third is via Broad Crag Col. This links Scafell Pike to the rest of the range - Broad Crag, Ill Crag and Great End. This can be reached from three directions, but the vast majority of people using this approach come from the direction of Broad Crag, having reached this long ridge via Esk Hause. Second most popular (a long way behind) is a path that leaves the Corridor Route above Piers Gill. This starts well but ends steeply. Finally the col can be reached up Little Narrowcove from Eskdale, but this is another long steep climb. I'd rather continue up Eskdale to Esk Hause and then follow the normal Ill Crag-Broad Crag approach. Scafell Pike has a large and very rocky summit plateau, with a smaller equally rocky rise forming the very top of the fell. It is surmounted by a large round flat-topped cairn with stairs up to the top, and with a nearby trig point. Between them these two features can act as a very useful aid to navigation in foggy weather (especially if you plan to return by the same route - in this case remember the relative position of the two features when you reach the summit). It must be said that foggy conditions are fairly common on Scafell Pike, which can attract clouds on days when every other fell is clear (presumably because of its location on the western edge of the district - the wet sea air rises very quickly as it hits Scafell and Scafell Pike and clouds form). I've been on Scafell in sunlight looking across at clouds on the Pike. When the top is clear the view is majestic, with a real feeling of being above everything in the Lakes. Just to the south of the main summit is a second lower rocky summit with better views down into Eskdale. Move a little to the north-east of the summit to see dramatic views of the crags of Broad Crag and Ill Crag, while a move to the south-west brings Mickledore into sight. Scafell Pike can only claim one tarn - the tiny expanse of Broadcrag Tarn, but this does share with Foxes Tarn the claim to be the highest named tarns in the Lake District. Scafell Pike to Scafell is one of the trickiest trips between two bordering summits. As far as Mickledore the going is easy, but the direct route up to Scafell is blocked by the crags of Broad Stand, an area for the rock climber and not the fell walker or scrambler. The walker has to lose altitude to reach Scafell - either down towards Eskdale then across to Foxes Tarn and up from there, or down towards Wasdale then up Lord's Rake (not a route I've every tried!) and from there up the western slope of the fell.